Every survivor in the zombie apocalypse will want to have a hidden weapon if the fight ever gets too close within reach. With the Red Skull Fold Out Knife, that is exactly what you will have on hand. This spring assist knife will fit perfectly away from view until the fighting gets close and you can slip it out to turn the tables. 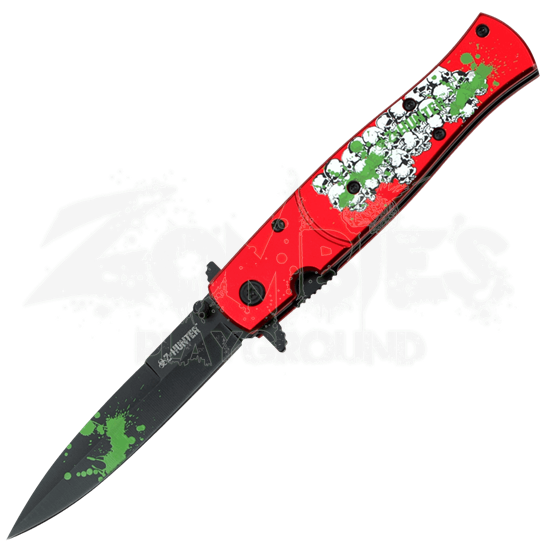 It is constructed with a black stainless steel blade with a blood graphic and aluminum handle with skull graphics. For your own secret weapon, make sure you grab the Red Skull Fold Out Knife.